Tiger is a National Animal of India. No wonder people from all over the globe has one desire to see the tiger in the wild. Many people end up seeing the tiger in a zoo while lucky ones are able to visit a tiger reserve. For many photography is a hobby or a profession and the tiger is the targeted animal. But it is a difficult animal to photograph since it is so elusive. The diverse habitats ecosystems and weather makes bring the big cat under the gaze of the lens is a Herculean task. The writes about how to go about photographing this magnificent predator ruling the Indian jungles. Indian Wildlife is diverse amazingly diverse and spread around the vast sub continent. Hence to photograph and see different mammals and birds you need to travel from one state to another. Depending upon which animal you wish to shoot with camera you need proper travel arrangements. A tiger picture is yearned all over the globe the majestic and wonderful animal is sought after by one and all. Be they amateur tourists, professional wildlife photographer all wish to create albums of this magnificent creature. In order to film and photograph tigers to have to visit popular tiger reserves. These are conservation units but facilitate tourism. The tourism in the Indian tiger reserves is governed strictly by set of rules and regulations. There are more than fifty tiger reserves in India. They are protected areas in the core or critical tiger habitats of which no human habitation is allowed. They are managed by guidelines framed by National Tiger Conservation Authority or NTCA. The Indian States where the protected areas are present govern the units. All this is under the aegis of Project Tiger program a Government of India initiative. The rules and regulations are simple. In the core area you are not allowed to be on foot. All safaris are conducted on open jeeps. A forest guide compulsorily accompanies the jeep along with a naturalist and guests. The naturalist is a privilege provided by the local hotels and resorts. You need an entry permit for excursions which is charged and has to be booked in advance. A permanent zone among many is assigned in your permit. You cannot transgress until unless you hold a full day safari permit which is costly. You cannot smoke, consume alcoholic beverages, litter, be noisy or disturb wildlife in any way. There are two safaris conducted in a day one in the early morning and another in the late evening. The timings change as per sunrise and sunset and the hours are fixed. If you cross over the time limit the guide and the jeep driver are penalized. Hence listen to them both when inside the core zone on safari. You can carry eatables but have to consume at a designated place usually called the center point. You cannot carry armaments or fire hazard elements inside the park. The speed limit is usually 20 km per hour please respect. And it moves only on the designated route. You cannot ask the driver to cross over the road into the jungle. Keep a safe distance from animals. Do not alight at any point except at the center. Toilet facilities are at limited juncture hence empty your bladder before hand. For wildlife photographers understanding the habitats in an ecosystem they are visiting is important. Most of the reserves are terrains with a mix of pure Sal or Teak forests. While few may be dominated by tall grass and swamps. Tiger do not live in open country they prefer habitats that give them plenty of cover. Because these predators hunt using ambush and short run. Hence good cover means you have a chance to see the predator. In summers whence the water becomes scarce your naturalist guide will target waterholes and rivulets. Most of the reserves comprise of flat topped hills with medium elevation. That can be an area which receives plenty of sunlight. The canopies are thick with vegetation and tall trees and animals here are usually seen at a short distance. In India days are large but densely forested areas may offer less light at predawn and late evenings. Also the weather may change a bit and sometimes the reserves will receive torrential rains, hailstorm or strong winds. The forests in Central India are dry or moist deciduous type with Sal or teak trees dominating. Mixed forest in these regions comprise of a large variety of floral element along with bamboo. The grasslands are short with medium sized grass associated with scrub. In Eastern and Southern India true tropical forests are present. They are very dense and the tigers here are elusive not a good place for expedition. But because of the habitat you may get a spectacular shot. The parks are much smaller than compared with those in Africa. They are divided in to core and outer buffer. Tourism takes place in twenty percent of the core. In buffer zones tourism is organized. Keeping the nature of habitats in the mind you can prepare yourself for a photo shoot in the reserves. In dense forests you need cameras with short focal length and large aperture. The best is 300 mm with 2.8 aperture. Due to light variations and instability you need critical lenses but good quality zoom lenses will do. For support you need a mono pod or a sand bag nothing else. Keep you equipment ready always albeit it will face lot of dust in dry weather. But there is rarely time to laboriously ready the camera. You will lose a good composition for sure. The big cats create fascinating movements, can be at the right habitat juncture in good light, and their expression can be highly amusing. This is no job for a slow worm. Tigers emerge all of a sudden and you have to be quick enough to compose and click. If you are not fast then photograph the deer. Speed is applicable with birds as well. Whence a tiger is emerging your naturalist will give you a hint. Be ready and be fast whence the predator comes in your view. These animals are very shy and elusive and easily disturbed by noise and jerky movements. Hence keep in the right position and avoid jerky movements. Aim & Shoot! Whole team will be tracking tigers hence keep you ears open. The naturalist guide will be speaking in English for your comfort. Your sensory apparatus will be at its best for it will assist in sighting the big cat as it emerges. Silence is the key discuss with the team only when you are in an area where likely hood of tiger movement is less. Your naturalist will be relaxed at that point and willing to listen to you. Anyway do not discuss or talk shop with the naturalist and guide reserve that for post safari session. Small grassland may accord a picture in the open, but African savanna like habitats are missing. Extended stay is the best in these reserves for lens men and film makers. Avoid budget accommodation since the whole tour may be strenuous. Stay in luxury and comfort. Read a lot about tigers and the ecosystem they live in.Study their behavioral characteristics. There are some fantastic publications online. Read about the wildlife destination you are visiting. Be prepared in advance about the region and also about the reserves. Usually the luxury accommodations have well stocked library. The best way for a tiger photographic expedition is book a package. These are packages offered by experienced tour operators. 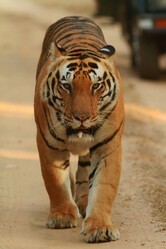 They are especially meant for tiger photography tourism in wild India. This way you avoid the hassles of booking a wildlife resort or other travels requirements. The hotel or resort you are staying should assist with local requirements like the naturalist and trained jeep driver etc. They will take care of jeep hire as well. Keep plenty of warm clothes for winters and some protection covers for your photography gear. As you can see, I'm a bit of a caterpillar nerd. These are the best caterpillar photos I've ever taken. Some caterpillars I've identified, some I haven't.